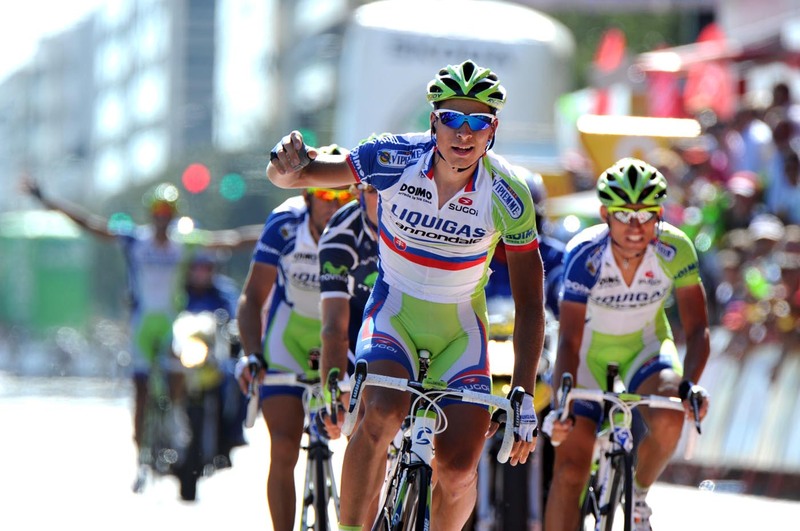 Peter Sagan (Liquigas) won the 2011 Vuelta a Espana’s sixth stage this afternoon, but in circumstances clouded by confusion. A daring and well-organised attack on the descent of the only climb of the day, a second category climb 24km before the finish, saw four Liquigas riders reach the finish in the front group, with only Pablo Lastras (Movistar) for company. With Vincenzo Nibali in that group, it seemed that the team were setting up the Sicilian to take the stage, and with it the twenty second time bonus available to the stage winner. With almost twenty seconds the gap to the next group of riders, that would have doubled the advantage earnt by the crafty attack in the first place. However, in bizarre circumstances seemingly caused by a lack of concentration and decisiveness by Nibali and teammate Valerio Agnoli, they failed to set their leader up properly. As they wound up the sprint, Nibali and Agnoli turned to one another, seemingly unsure as to their plan. Sagan, the strongest sprinter of the group, seemed to be marking Lastras and, as the Movistar rider began to edge passed the leading duo, Sagan kicked past the group and took the stage. There was visible division and anger amongst the Liquigas rider after the finish, with Nibali remonstrating at his teammates. Lastras took second place, with Agnoli in third and Nibali fourth. With four riders present, it is remarkable that Liquigas didn’t manage to ensure Nibali won the stage, but it was arguably a bigger crime from the team’s point of view that Agnoli took third from Nibali when he could easily have put his brakes on and given his leader more bonus seconds. Although they may have jeopardised the end result with their disorganisation, the Liquigas riders deserve credit for the move that set them up. With the peloton descending the climb, the team put men to the front and opened a 10 second gap on the rest of the field as they careered downhill, touching speeds of 90kmh in doing so. They managed to add a further seven seconds to the chasing group on the flat run-in to the line. Following them into the finish was a group of 10 that included Sylvain Chavanel (QuickStep), the holder of the leader’s red jersey. He did enough to defend his position and leads the race tonight by fifteen seconds from Daniel Moreno (Katusha). 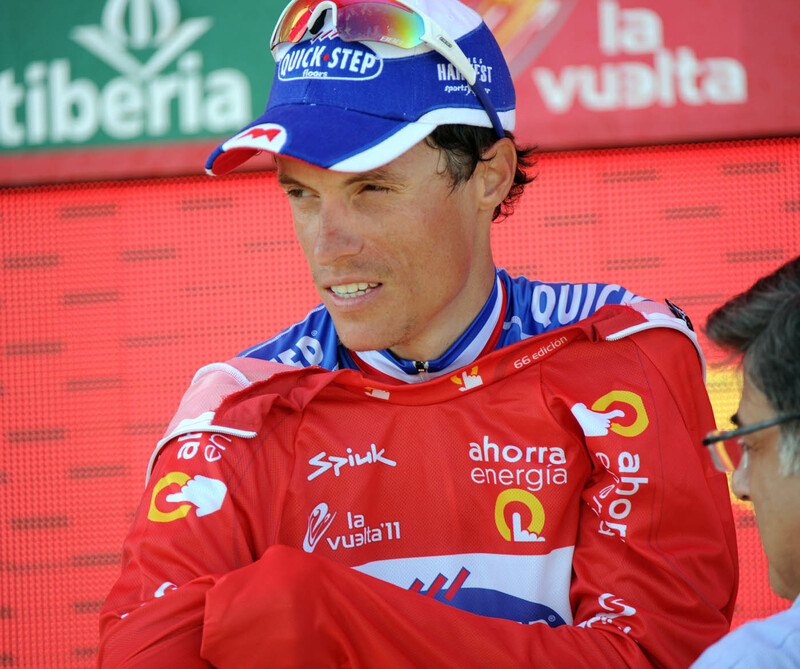 Also included in that group were three riders who had attacked on the Alto del Catorce por Ciento climb – David Moncoutié (Cofidis), Tony Martin (HTC-Highroad), Kevin Seeldrayers (QuickStep). They, along with David De La Fuente (Geox-TMC), developed a lead of 10 seconds at the beginning of the descent, but their advantage was cancelled out by Liquigas’ team attack. Bradley Wiggins (Team Sky) finished in the third group to cross the line a further six seconds back and 23 behind the leaders.